You can write to us at: SITAM AB, 3 Stefanou Tatti, Thessaloniki, 54622, Greece. Our Headquarters are in Thessaloniki, Greece. We also have a branch in Athens, Greece. eTelestia is the name of a project aimed at developing a global online network offering localised eLearning content and services in the fashion and clothing sector in a number of languages. www.eTelestia.com is the accompanying website. eTelestia will initially deliver the learning content in the following languages: English, French, German, Greek, Norwegian and Spanish. The eTelestia courses are home study courses, and therefore you will not receive a qualification from eTelestia. However, our courses are recognised by a number of examining bodies, higher education institutions and other bodies worldwide and can be used towards a recognised qualification in many instances. For more information on how you can use your eTelestia course towards a recognised qualification, please contact us by email, stating which course(s) you are taking or are interested in and your country of residence. If you have a problem with your OT then you can contact eTelestia using the confidential email address provided to you for this purpose. You will be assigned an Online Tutor (OT) when you start your course. If you experience any difficulties or have any problems, you should contact your OT via the student pages of the eTelestia website. Your OT is there to help you through your studies every step of the way. eTelestia will supply the drafting template and instructions as part of the course. You will need to buy basic drafting tools and perhaps other equipment, depending on which courses you are taking. The basic drafting tools required are: Drafting paper, pencil, eraser, scissors, pins, tape measure. You should be able to buy all your equipment at a haberdashery store. Our courses have proven extremely successful over a number of years and are used in a number of institutions worldwide already. Now you can benefit from that experience from the comfort of your own home and study at your own pace, with the reassurance of knowing that there is always a helping hand via the eTelestia website if you have any difficulties. eTelestia courses can certainly give you the knowledge and skills required. Our courses have been running successfully for a number of years with very good results. If you follow the course, you will develop the skills and knowledge required to let you turn your garment ideas from imagination into reality. And although we can’t guarantee you’ll be the next Versace or Vivienne Westwood, the eTelestia course will give you the skills and confidence to start creating your own garments. After that, who knows what might happen? 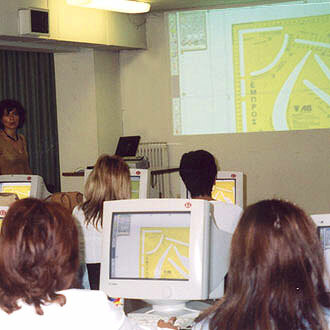 eTelestia offers courses on Pattern Construction, Fashion Design and Virtual Clothing Factory. You can choose to register on one or more courses, depending on your requirements. You can choose to study a theme as a complete module, or you can choose to study shorter sub-modules from each theme. Yes, it does. The Core Application Software is compatible with the Macintosh OS, also. The CAD software Telestia Creator operates on a Windows environment, but you can run it on a Mac by installing Windows on either VMWare or Parallels and run it on a separate window in your MacOs environment. It is quite common practice and very easy. The minimum requirements are PC Pentium 4 or equivalent AMD, 2 GHz, 1 GB RAM, ADSL internet, 1024x768 graphics card, Windows 2000/NT/XP/Vista/7. 2 GB of free hard disk storage. There are two AB Templates- one for the Pattern Construction Course and one for the Fashion Design Course. These are basic tools you will need to enable you to draft your patterns and designs. They are constructed from highly durable materials and with care will last you for a life time. "The eTelestia courses are home study courses so every aspect of the course is organized for it to be learnt in any environment. When you register for your course you will be provided with a complete list of the items you will need but we have found from experience that you probably have most of these items already at home. If you take one of our many types of pattern construction courses you will need a flat table, a sewing machine (you don’t need an expensive or advanced sewing machine to complete our courses) Drafting paper – (Brown paper, cake lining paper, ) pencil, scissors pins and tape measure. All this is available at you local haberdashery store. If you decide to take one of our fashion courses you will only need to acquire a pencil and drawing pad. ETelestia will supply you with the necessary template." Only authorised employees of SITAM-AB have access to the information you provide at registration and those details will only used in connection with providing you with your course and related eTelestia information.